Heat oven to 350°F. In small bowl, mix cream cheese, sugar, coconut, honey and lemon juice with wooden spoon until smooth. Grease cookie sheet. Unroll dough unto work surface and separate into 2 large rectangles. Overlap long sides to form 13x7-inch rectangle; firmly press edges and perforations to seal. Spread cream cheese mixture on rectangle. Starting with 1 long side, roll up; press edge to seal. With serrated knife, cut into 12 slices. Place cut side down on cookie sheet. Bake 15 to 20 minutes or until golden brown. 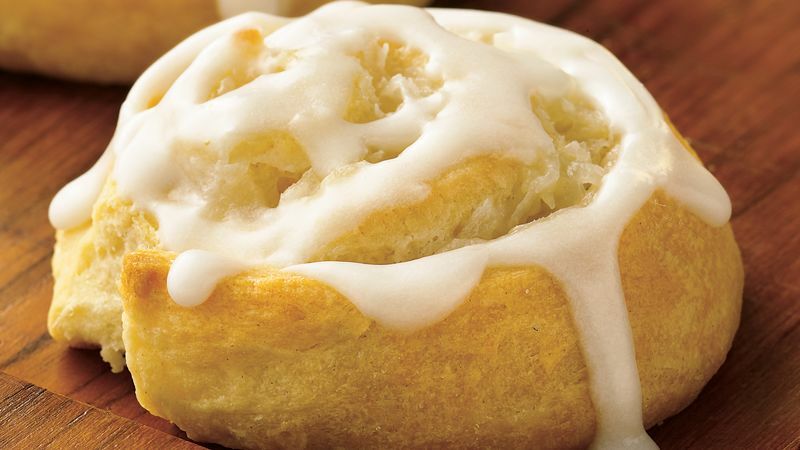 In small bowl, mix glaze ingredients; spread on warm rolls. Cover and refrigerate any remaining rolls. Keep refrigerated crescent dinner rolls refrigerated until ready to use. If filled roll of dough is too soft when slicing, place in refrigerator about 15 minutes or until firm. If you like coconut, add the amount specified to the cream cheese filling. Sprinkle additional coconut over the glaze.